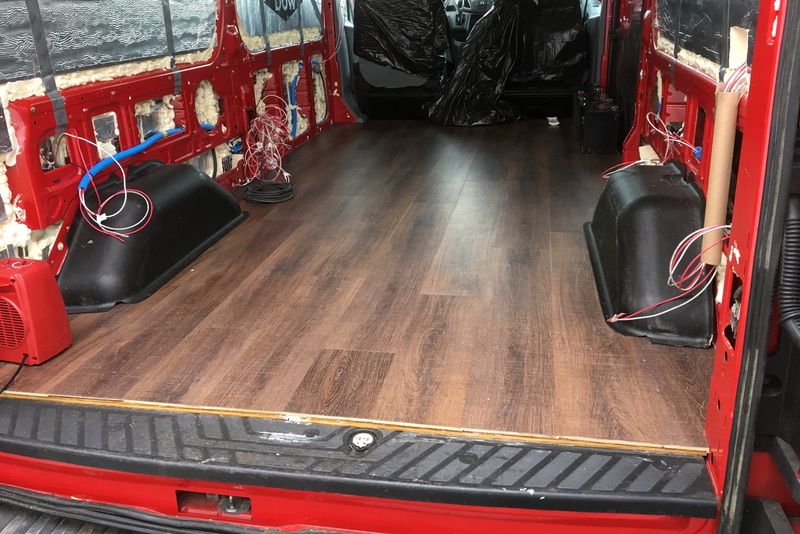 Installing flooring in a van is pretty similar to installing it in a house, but there are a few key differences. 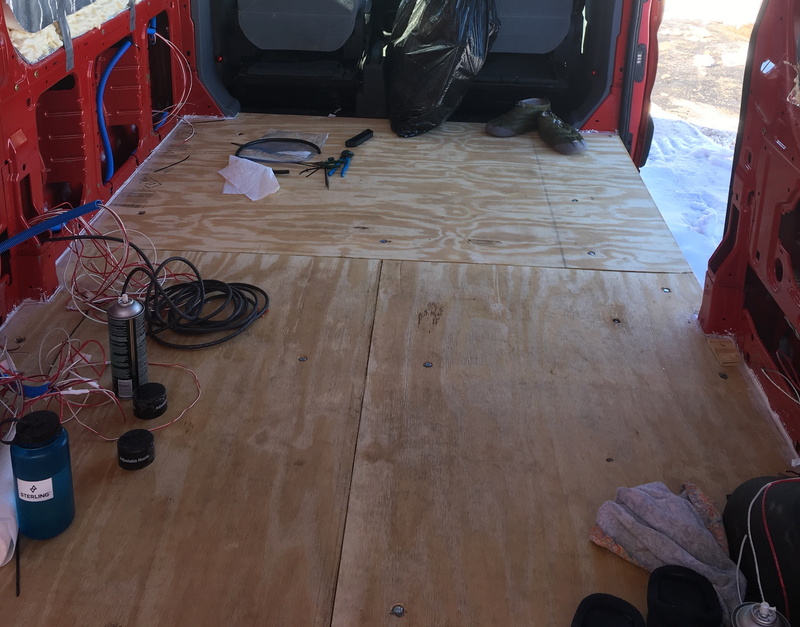 The flooring in a van will extend under the cabinetry, the subfloor will be anchored to the base of the van, and the flooring needs to be glued down. Because of this, it is harder to redo/replace the floor. So, it is critical that you select a durable flooring and take your time during the installation. The three things you will learn below are how to install a subfloor, flooring, and trim. Before getting started, take some time to vacuum up any excess pieces of insulation, dust, or whatever else may be floating around on your floor. Make sure you don’t accidentally vacuum up your wooden blocks or washers. If you are concerned about doing this, temporarily remove them (add location labels to the wooden blocks before doing so). 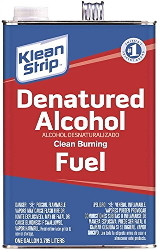 Sweep the floor and wipe all surfaces with a wet rag. 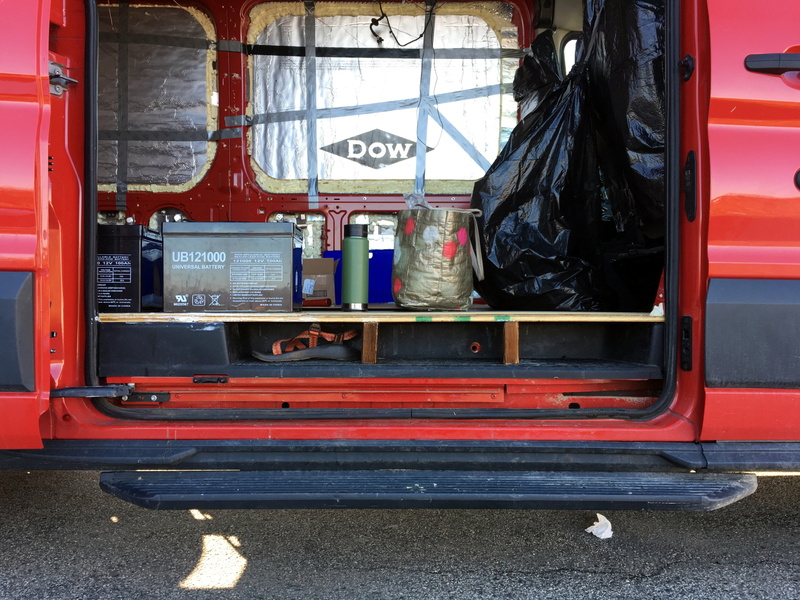 Clean surfaces are critical in ensuring proper adhesion of the Polyisocyanurate (Polyiso) to the van using 3M Adhesive. 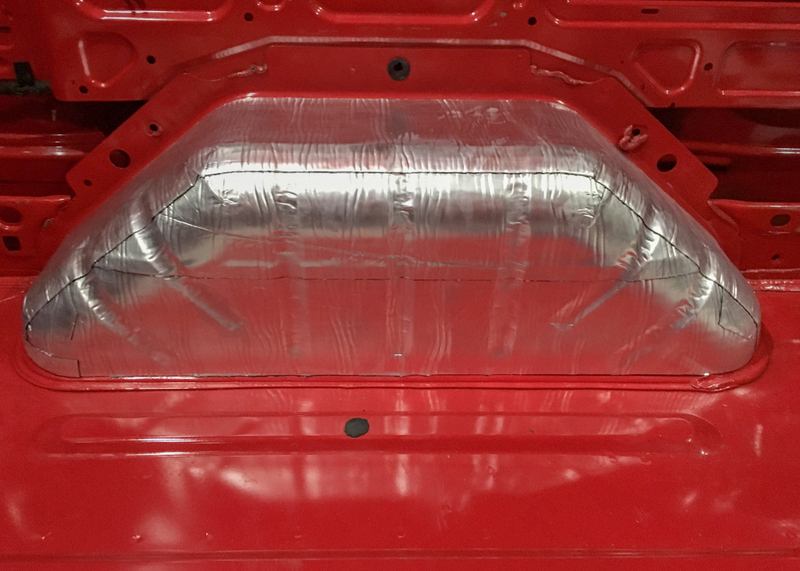 Additionally, make sure that the front seats are protected, by putting trash bags over the back supports and cardboard in the seat (in case you put anything sharp down). First, decide how you want your subfloor plywood1 configured on the floor (see photos below for our configuration). 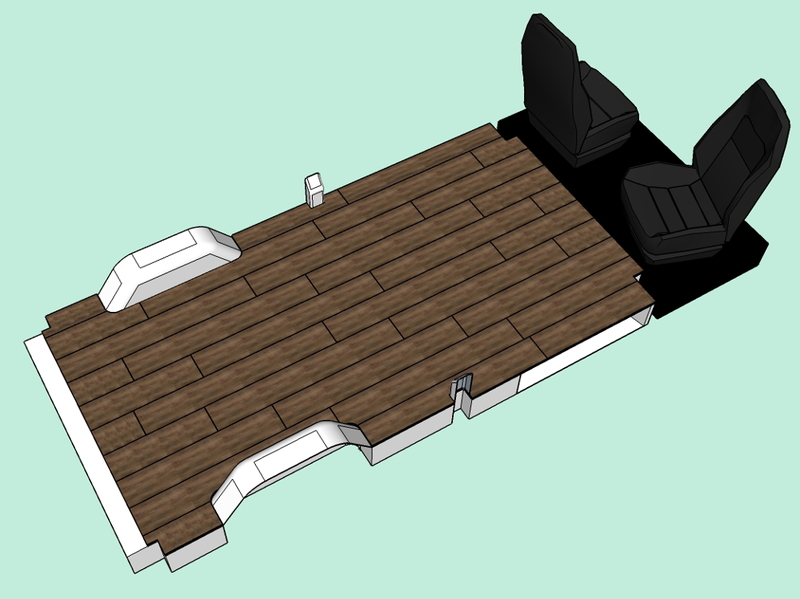 You can use Sketchup to determine this or just remove your cargo floor mat and lay it on top of your plywood to see how your configuration will lay. Having one piece perpendicular to the length of the van and two parallel seemed the most efficient and structurally favorable to us. You’ll notice in the photos that we also chose to cover the step by the door. Now you are ready to trace your cargo floor mat onto your three pieces of plywood2. Note: Later you will be joining the pieces of plywood with lap joints by routing along each edge, so be sure that you add 1-2 in. of buffer/overlap where the pieces of plywood touch. To have the contact points of each piece of plywood overlap each other nicely, I suggest using a straight edge for your guidelines. 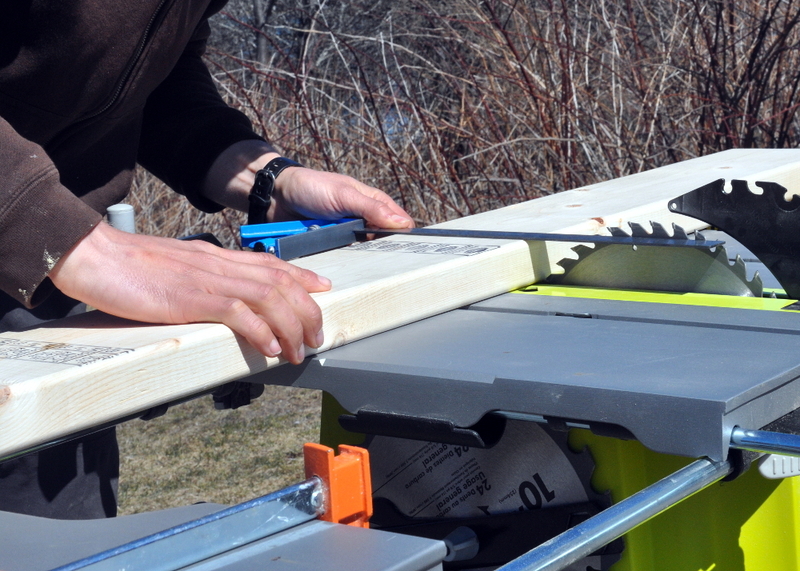 Using a jigsaw, begin cutting the plywood sheets along your guidelines, using the iterative process mentioned above. When your three pieces are cut, you can start routing the edges that will overlap to form lap joints. To do this, adjust the routers depth to be half the thickness of the plywood and test the router out on a scrap of the same type of plywood. If the two test pieces make a smooth lap joint (no bump or indent at the joint), you are ready to cut on your actual plywood sheets. 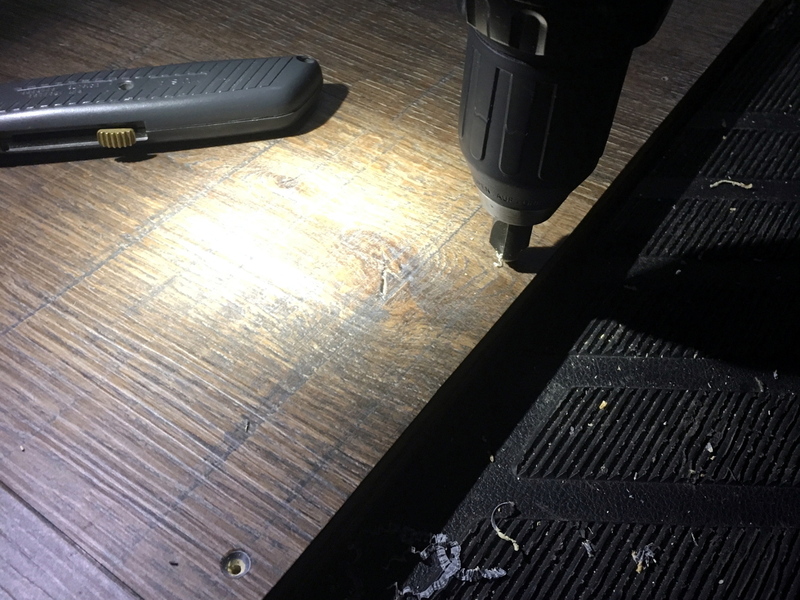 Once your sheets of plywood are cut and routed, such that they lay flat on the floor of your van, you need to add counter bores and drill holes (for anchoring the subfloor to the van). 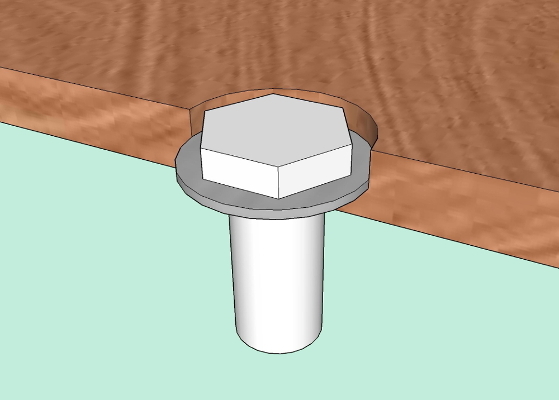 Screw transfer screws into the threaded riv-nuts on the floor of one plywood region of the van. 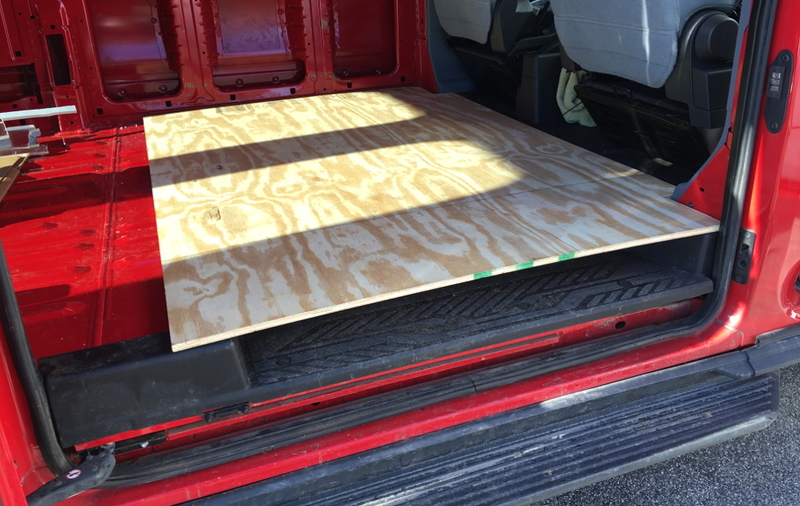 Place your plywood sheet where you want it to lay on the floor of the van, being careful not to prematurely place it in an incorrect spot3. 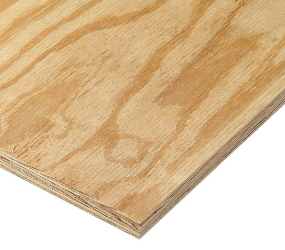 Apply force to the top of the plywood so that the transfer screws can form indentations in the plywood. 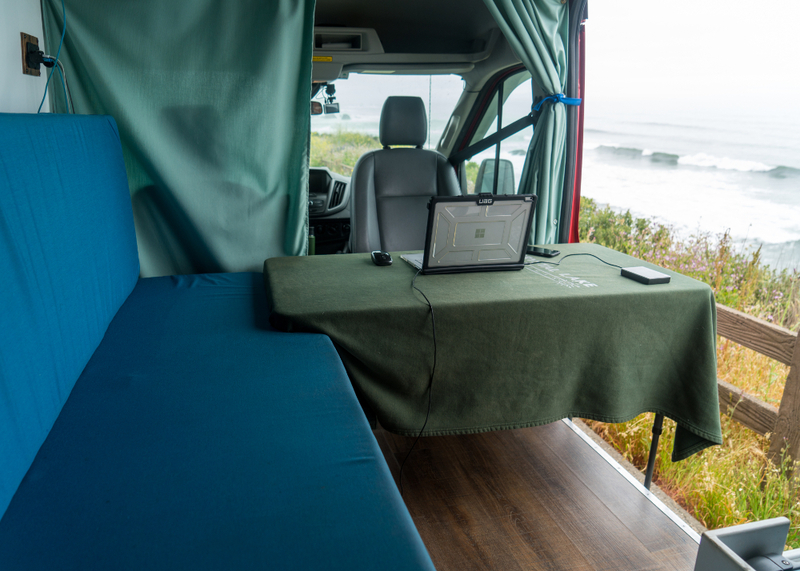 Remove your sheet of plywood from the van and circle the indentations so that they are easy to find later on. Note: Start with the plywood sheet that forms the base of the lap joint for the other two sheets. 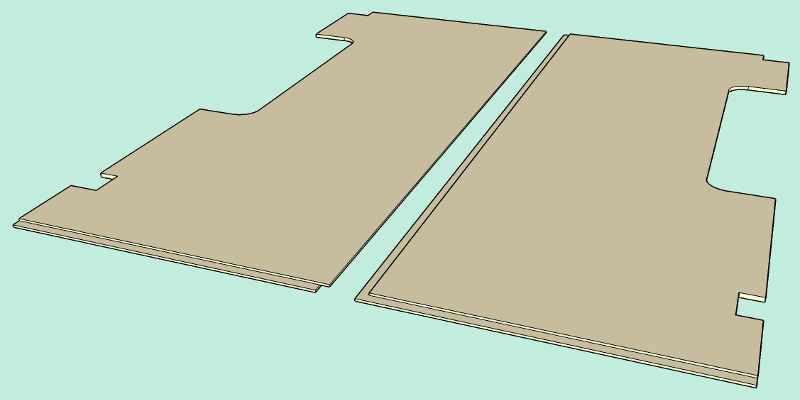 Then, have the second plywood sheet be the one that forms the other part of the lap joint base. Have the last plywood sheet be the one that forms the top of the lap joint. 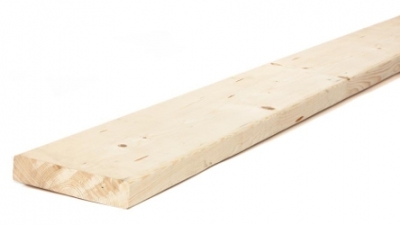 This order will help to ensure that you plywood sheets align with one another properly. 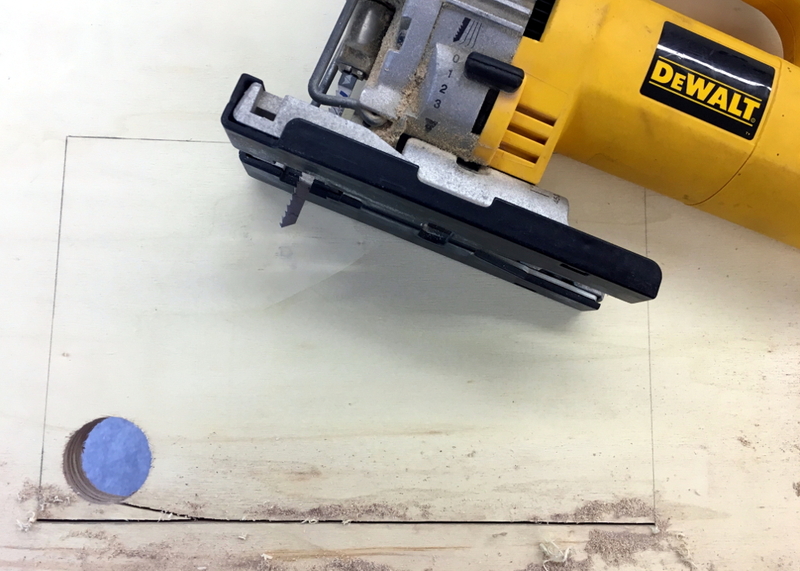 Drill 1/8″ pilot holes at each indentation on your sheet of plywood4. Flip the plywood sheet over. 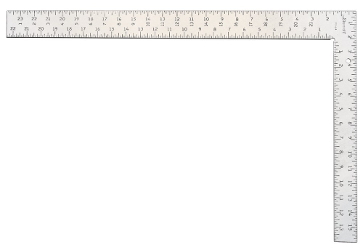 Measure the thicknesses of your bolt head and washer (using calipers) and combine these values. 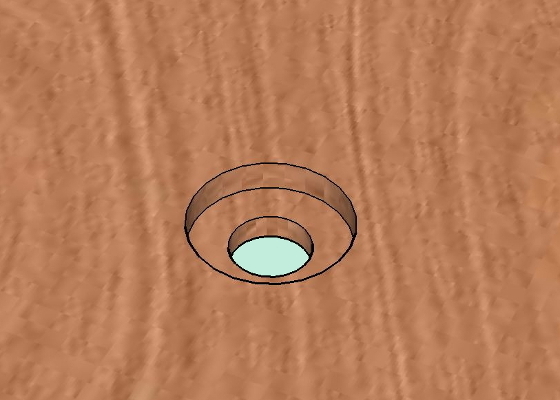 Drill counter bore holes at each pilot hole using this combined thickness as the depth. Next, drill bolt holes in each place that a counter bore was drilled. 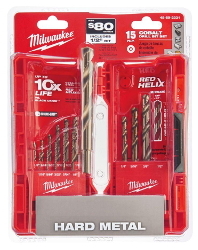 Note: You may want to drill the holes one size larger than your bolt diameter to make it easier to screw the bolts into the threaded rivnuts/minimize the chance of cross threading. 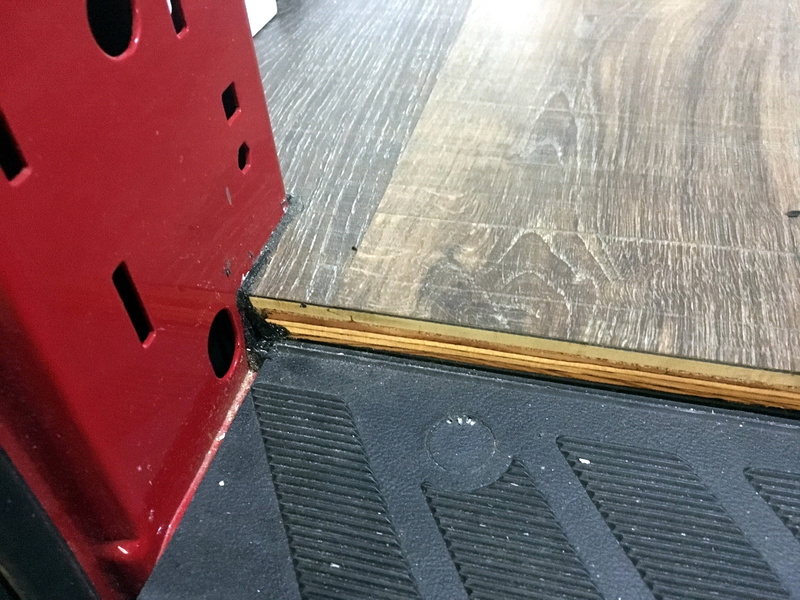 Before moving onto your next plywood sheet, anchor the sheet you just made holes in to the floor of the van using washers and bolts in the counter bore and drill hole. Note: Be very careful not to cross thread your threaded rivnuts! Repeat these steps for the other two plywood sheets. 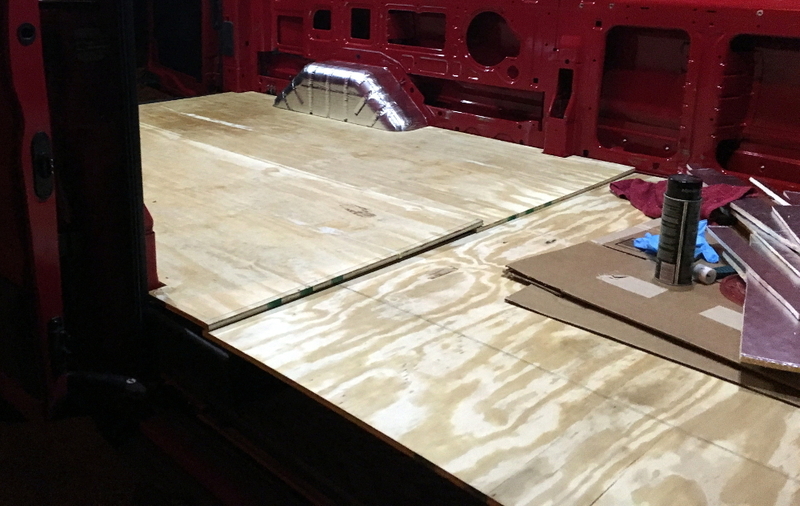 When finished cutting all of your plywood sheets, remove them from the van, in preparation for the polyurethane step. Polyurethane the bottoms, sides, and inside the counter bore holes of each sheet of plywood. 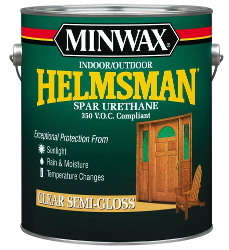 With regard to number of coats and dry times, follow the instructions on your polyurethane can. Make sure to sand any large buildup points of polyurethane off between coats (don’t worry about small ones because the subfloor will soon be covered). Note: Do not polyurethane the tops of the sheets because, when installing the flooring, this will prevent the glue from adhering to the subfloor properly. Check to see that your wooden blocks and washers are still in the correct locations on the floor. 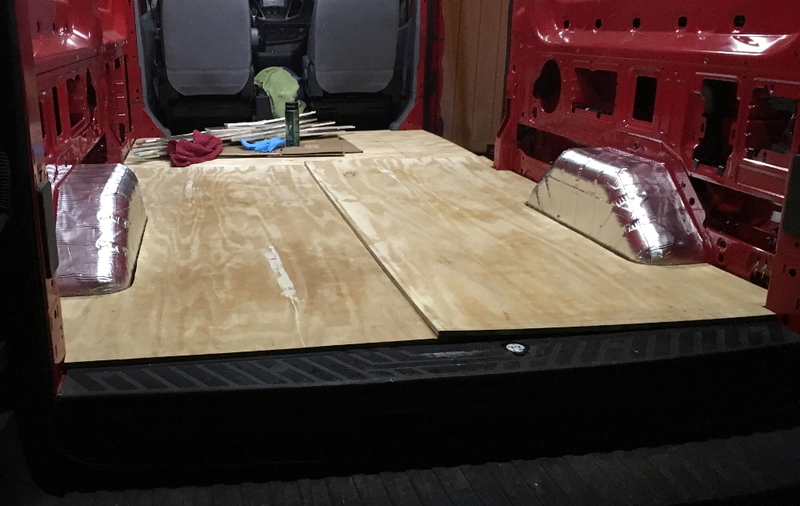 Starting with the plywood sheet that forms the base of the lap joint for the other two sheets, anchor it to the floor of the van, using the washer and bolt that was used in the previous step5. Apply wood glue to the base of the lap joint on the first sheet of plywood and anchor the second plywood sheet. Clean up any excess wood glue that oozes out between the cracks with a rag6. Repeat step 3 with the last sheet of plywood. 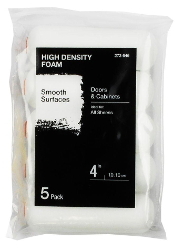 Now you are ready to begin sealing the subfloor with silicone7. Silicone all edges of the subfloor that form contact points with the walls. Make sure to smooth the silicone, so that it is level with the floor. If not, the flooring will not lay flat. Next, silicone the cracks between all of the lap joints, again being sure to smooth the silicone so that it is flush with the plywood. 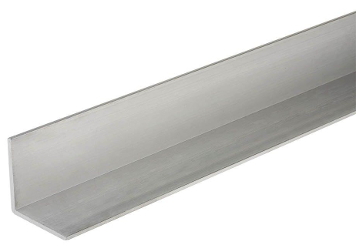 The floorstep supports are used to do exactly what it sounds like, help support the flooring above the floor step. The plus side to this is the added storage space below the floor. The critical detail is to make sure your shoes, or whatever you intend to store here, will fit in the storage area. Last minute, we decided to stain our supports and are happy we did, as they blend in better with the flooring. 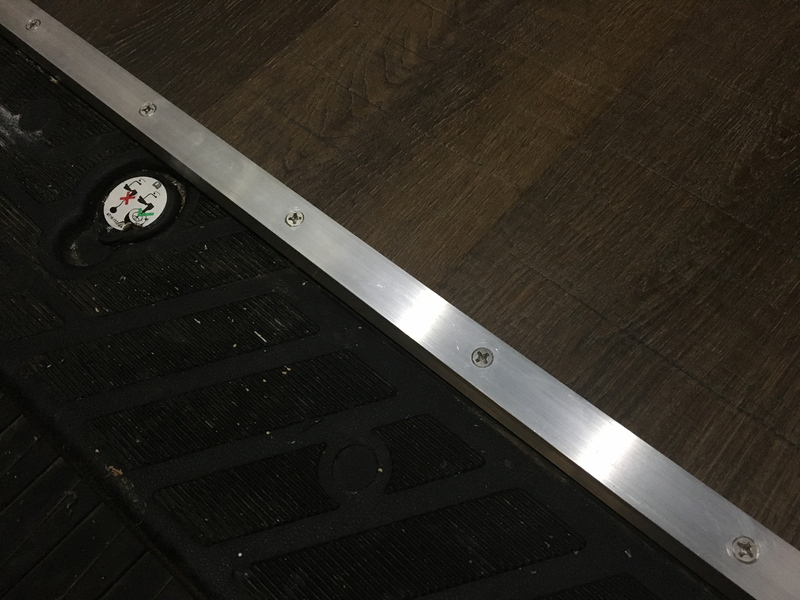 Measure the height between the step and the subfloor. Using the 2in x 6in lumber, cut two blocks to size, accounting for any shrinkage that may occur in the wood. Test fit the blocks (they should feel very snug). Stain and seal (polyurethane) the wood. Mark (on the floor) where you want your supports to go, using a square to ensure that your support blocks are perpendicular, and include marks for where your screws need to go. Also mark the center point of the support blocks, so that you can align them with the subfloor marks. Put the support blocks between the subfloor and step in their marked locations. Anchor your support blocks by screwing down through the sub floor and into your support blocks. 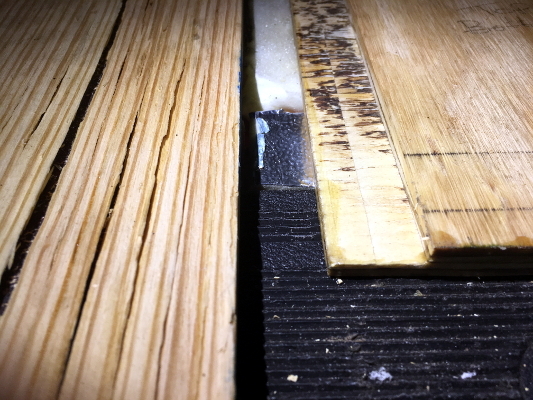 Warning: we have seen a lot of poorly installed flooring, with gaps between floor pieces and gouges. It is important that the floor be installed well because it will be really hard to replace once you are done with the conversion. 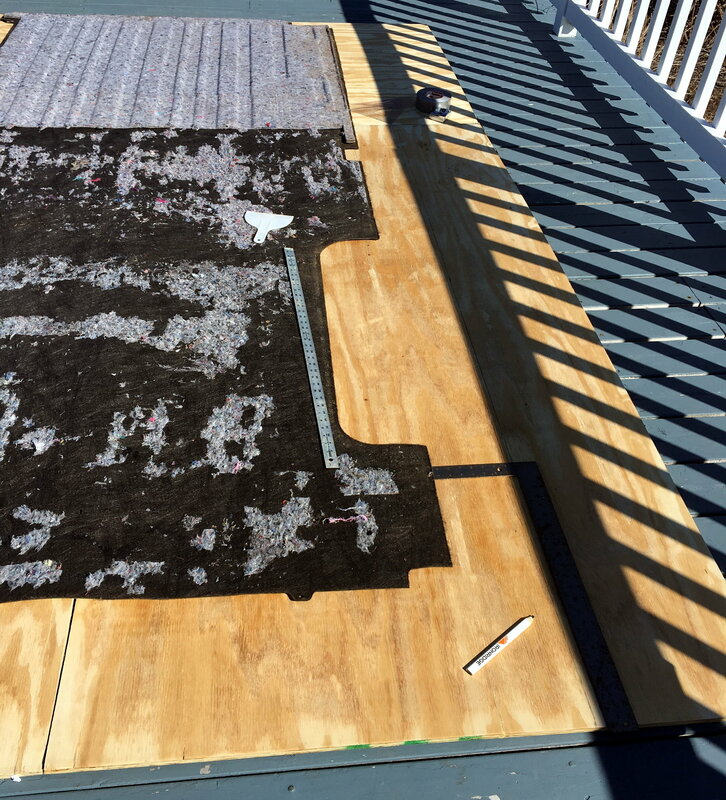 Additionally, if you are installing the floor in the winter and using the same material that we did, make sure the temperature is above 32F! 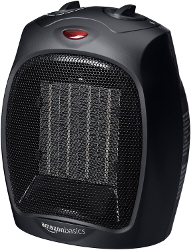 It is not stated in the manual, but COREtec warps in freezing temperatures. To assist in ensuring snug fits between flooring pieces, we used a pull bar. This was a very helpful tool, but, if you are looking to save money, you can easily make a jig as well! Patience will be the most valuable tool here. 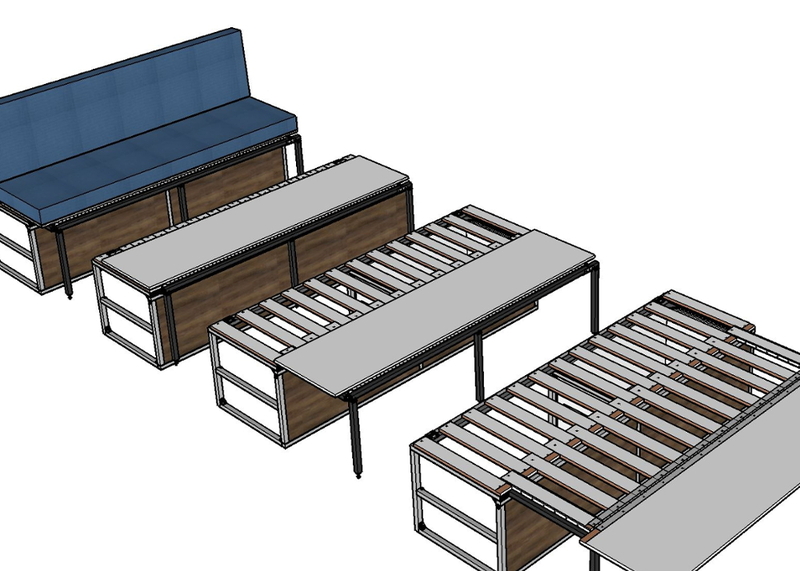 To determine the most efficient layout of the floor pieces, we first planned the layout in a Google SketchUp model. This also helped in making sure none of the ends of the flooring pieces would line up. Using a table saw, jigsaw, straight edges, and a jig cut the floor piece in whatever shape it needs to be to fit in the space. 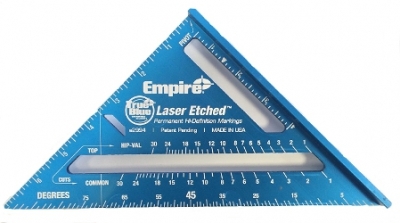 Note: you can only cut end pieces to shorten their lengths and you can only cut edge pieces to shorten their widths. 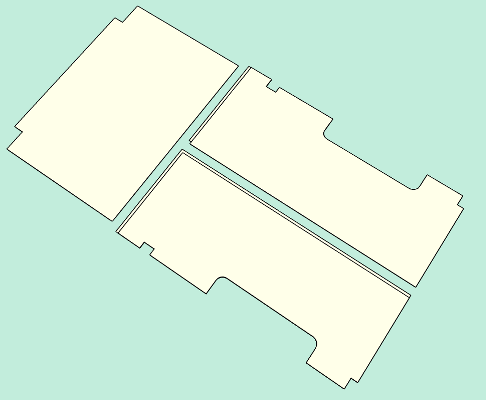 If you cut elsewhere, you will not be able to properly fit the flooring pieces together. You may want to make a template out of cardboard before cutting, when trying to fit to odd shapes such as the wheel well. Lay the piece of flooring on the subfloor, where you want to install it, and trace around it, marking your subfloor with a pencil. 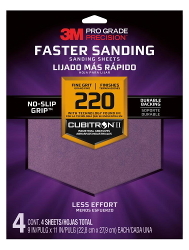 Using Titebond III, glue the subfloor in the area you just traced. 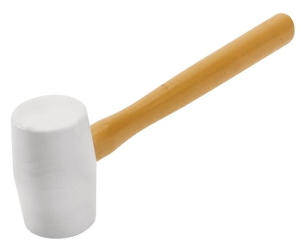 Following the flooring installation instructions that came with your flooring, lay the floor piece on top of the glue and, using the pull bar, rubber mallet it snug against the coinciding flooring piece. Note: Be sure to wipe up any glue that oozes out the sides of your flooring. 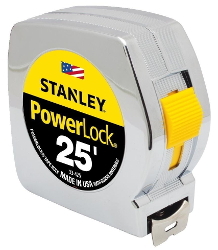 When finished, place a heavy object (we used our batteries) on top of the edges of your flooring. Repeat this process until you are finished with the flooring. Once finished, you will need to add another layer of silicone to the sides of the flooring, the same way you did for the subfloor. 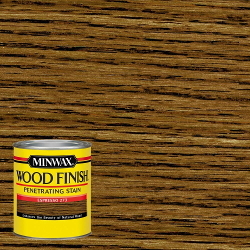 In order to better protect the edges of your floor and have them look more finished, you should add trim. 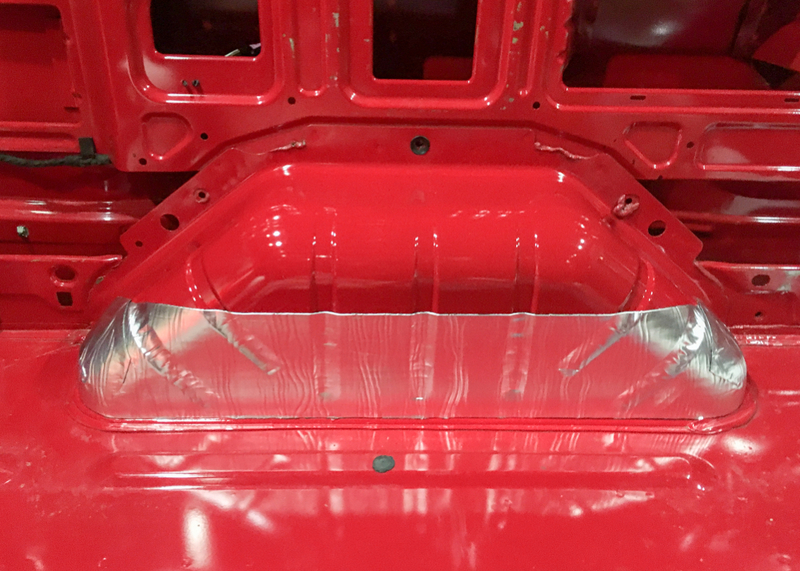 We used 1″ aluminum angle and added it to the following parts of the floor: behind the driving area, sliding door, and rear doors. Remove any silicone that may prevent the trim from lying flat. 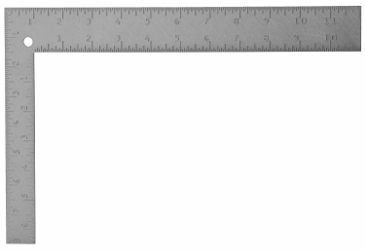 Measure the length of the area you are adding the trim to and cut it to this length. Note: Your flooring may not be 1 in. thick, if this is the case, you may want to consider ripping the trim so that it is the same thickness of your floor. Check to see that the trim fits. 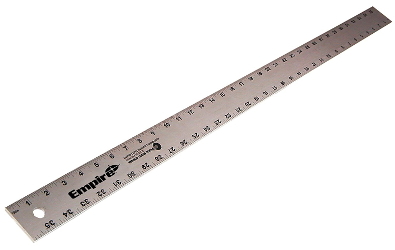 Determine what you want the spacing of your screws, for anchoring the trim to the floor, to be. Mark your screw locations on the trim with a punch. 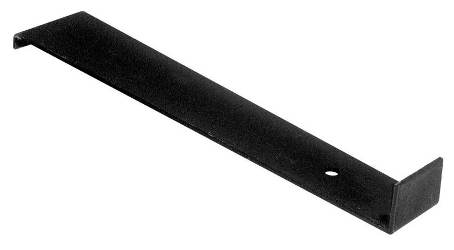 Drill pilot holes into your trim. 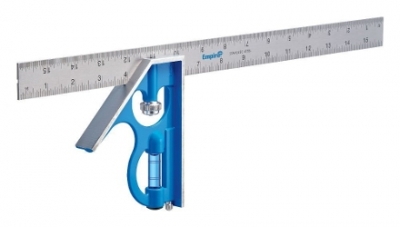 Place your trim piece where you want to anchor it and mark the hole locations with a punch. 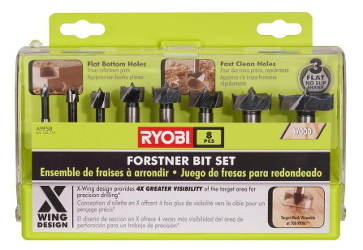 Using a drill press, drill counter sinks, with the depth necessary for the angle of your screw head, into your trim. 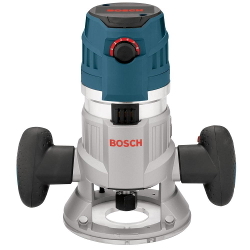 Drill counter sunk holes in your floor punch locations. Anchor the trim to your floor using screws. 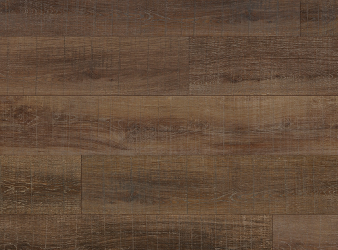 We chose BC Pine Plywood because, while the floor is a high use area, the subfloor doesn't get any direct contact. 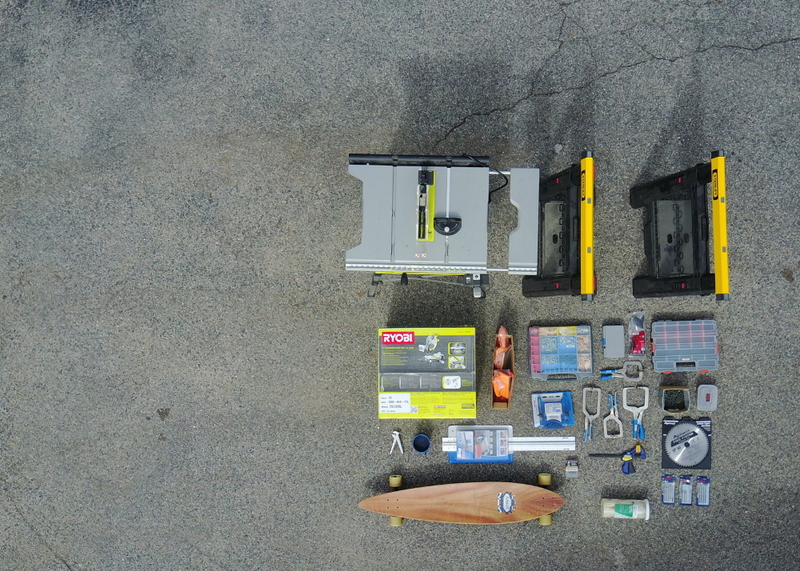 This isn't the nicest of plywoods, but it gets the job done and should easily last the lifetime of the vehicle. It was also an area of the conversion that we could save money on. 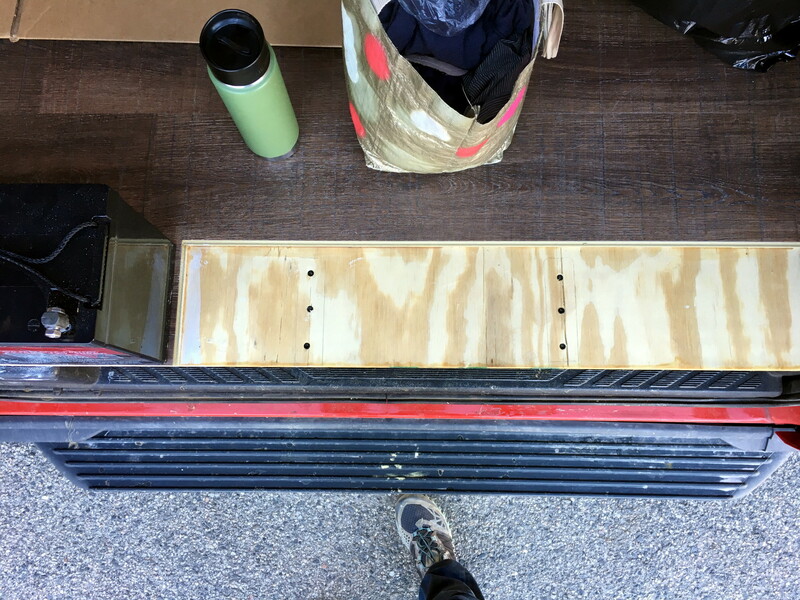 We did this to maximize floor space in the van and add an additional shoe storage area. Alternatively, some people keep the step exposed and put a carpet to wipe their feet off here. Prematurely laying the plywood on top of the transfer screws will result in a second set of indentations that will cause confusion later on. Drill 1/16" holes where your transfer screw indentations are. 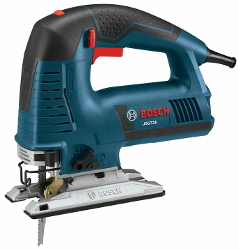 Then, flip the board over and drill counterbored holes. Last, drill bolt holes through the center of the counter sink holes. Drilling in this order will maintain your center mark throughout. 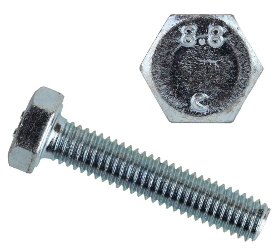 It is best to screw a bolt into a threaded rivnut by first hand screwing it. 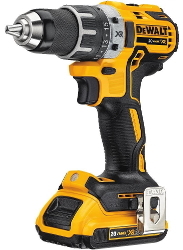 Once the bolt is as tight as you can get it by hand, you can use a socket wrench to finish tightening the bolt. The easiest way to cleanup glue is to use a wet paper towel. In our case, the silicone around the edges of the floor was going to be visible in some places. So, we chose black silicone for a more finished look. There isn’t much to say here except that we might have used a different type of adhesive for bonding the floor to the subfloor. 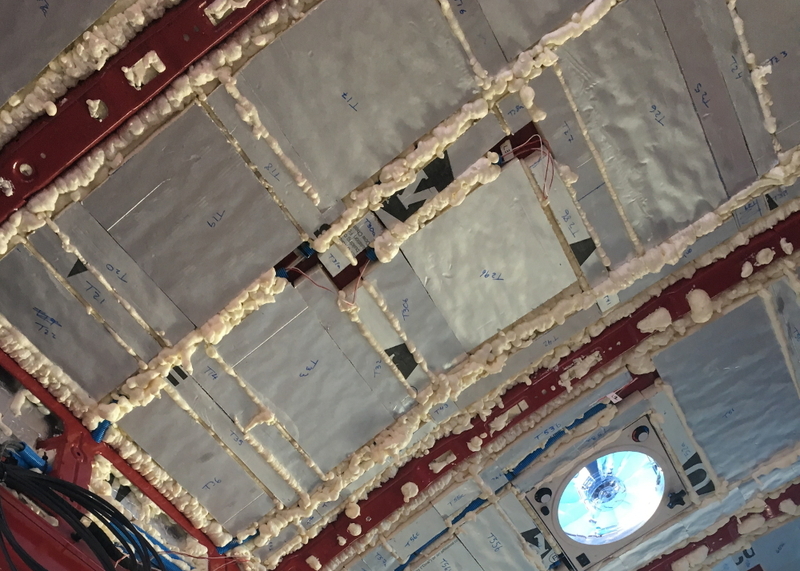 We had chosen Titebond III because of its working temperature range, but, after reading the user manual for our flooring, we learned that there was a suggested type of flooring glue. The downside to the suggested glue was that it could only be purchased in larger quantities. So, in our case, Titebond III was the next best thing.